You need to present to your potential app users the best features and usability of your app. And to fulfill that purpose, we have designed AppCloud a Premium Quality Responsive App Landing WordPress Theme to make your life easier so that you can concentrate more on developing your apps and less on designing an app landing page. By building a landing page using this Premium Quality Reesponsive App Landing WordPress Theme, you will be able to showcase your apps or games or software products in a very stylish way. AppCloud is nicely crafted with King Composer page builder, Powerful theme option, One click demo importer and Bootstrap 3. AppCloud ensures elegant design and awesome UX (user experience). In terms of design quality, it’s one of the best WordPress Theme in landing page category. Nice jQuery effects and CSS3 animations are used in this Responsive App Landing WordPress Theme. Not only that, its Creative sections let you showcase your app or game’s or its amazing features without any clicking, right on the front page. If you develop your site using AppCloud- Responsive App Landing Page WordPress Theme, its sublime and soothing design along with smooth browsing experience is bound to turn your potential clients and visitors into confirmed users- that we can promise you. One Page template is loved by millions of people all over the world and it is the recent web design trend. 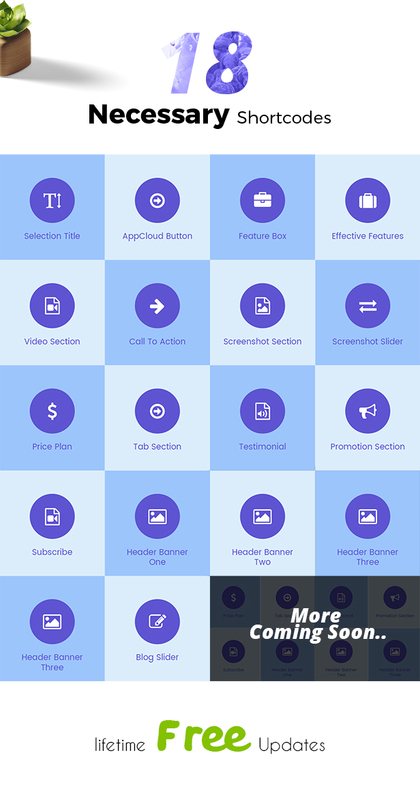 AppCloud is a one-page App Landing WordPress Theme with all the necessary sections in just one page. You can remove any sections if you want or feel that is unnecessary. And if you are a developer, AppCloud is designed in such a way so that you can easily create new sections or modify existing ones in minutes according to your needs. As your target population is going to visit your site with their handheld devices, it is a MUST for you to make your landing page Mobile-friendly. That’s why, we have developed AppCloud on the mobile-first design concept. We designed the template for smartphones and then scaled it up for bigger devices. And before launching, it was tested on almost all browsers and each & every kinds of devices such as smartphones, tablets, iPads and desktops to ensure you a glitch-free, smooth experience regardless of what platform you are using. We maintained this concept very carefully and accurately making AppCloud a fully responsive app landing page theme. Bootstrap 3 has made it easy to design a responsive mobile friendly WordPress Theme. The grid system of Bootstrap 3 is properly maintained while coding. This app landing page template is 100% responsive and mobile ready. You can test it from google mobile friendly test! Although AppCloud is mainly an app landing page theme, but it can be used for multiple purposes. Different types of people or business owners can use this landing page WordPress Theme. In fact, it can be a great theme for your offline product’s landing page as well. Try it out, and see for yourself! Like all the other templates from WebtechToday, this app landing WordPress Theme is SEO (search engine optimization) friendly. The codes are well documented. You just have to add your own meta title and meta description to rank higher in the google search result. As a SEO-friendly app landing page, AppCloud should be your first choice for your next big App launch.